Are you tired with your traditional and old 2-burner gas stove? Are you planning to have a modular kitchen in your new home or to redesign your kitchen? Is 2-burner gas stove is no longer sufficient to you and your family and wastes more time than needed in the kitchen? A 3-burner gas stove is all you need no matter what. If you are a mid-sized family, you may definitely need a 3-burner gas stove. It will improve the cooking experience and the overall look of the kitchen. Type of Ignition – Gas stoves are available in manual and auto ignition. With manual ignition, gas stoves need matchstick or lighter to light up the flame. On the other side, you just have to turn on the knob and the flame will light up automatically in auto ignition. You don’t need lighter or match stick Auto ignition gas stoves are very convenient. But keep in mind that they are expensive and need proper handling. Repair cost is also high in auto ignition. Space between the burners – Be sure 3 burners have ample space in between so they can be used at the same time if you need something. In case there is not much distance between the burners, you may not be capable to use them at same time. Position of Gas Pipe Inlet – The gas pipe inlet either is placed at the sides or at the back of gas stoves. You should look for gas stove with inlet at the sides if you have narrow width counter. In order to save on the proper usable counter length, you should look for gas stove with inlet at the back. Steel or glass cooktop – You can find the gas stoves made of stainless steel or in glass tops. Glass top gas stoves look attractive and are easier to clean. But stainless steel cooktops are durable. For better strength, choose gas stoves with tough glass tops. Be sure the glass stove top is toughened and heat resistant when choosing glass top stove. Size – Always consider the size of kitchen counter/slab and kitchen chimney when buying 3-burner gas stove. Be sure to go with 3-burner gas stove which meets your needs in size as you may have problem with large gas stove. Lifelong 3 burner gas stove comes with toughened glass top that is heat resistant and break resistant. The burners are very efficient and are spaced well for keeping large dishes side by side. A stove might skid or shift its position when applying high pressure or stirring the dish. But you don’t have to worry with Lifelong 3 burner gas stove as it comes with anti-skid feet to keep the stove steady even when excessive force is applied. It is also very easy to clean this gas stove. All you need to wipe it with soft and clean wet cloth. It consists of thick pan supports in 3 burners to prevent accidental falls. Prestige Marvel Glass 3 Burner stove has been designed well with solid black toughened glass top. It is very easy to clean as it has spill proof surface. The stove has tri-pin brass burners for faster cooking, consistent heat, and better efficiency. It consists of individual pan support to ensure steadiness and durability to pans and pots when they are placed on it. It comes very handy when using small pans. The knobs are very easy to use and are ergonomically designed. 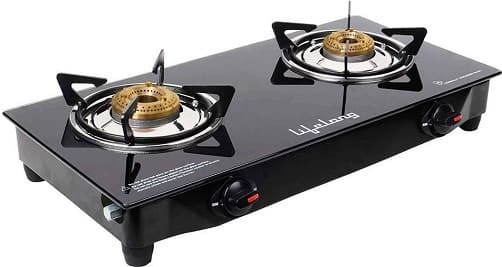 This gas stove has manual ignition and is available with 2 years of warranty. 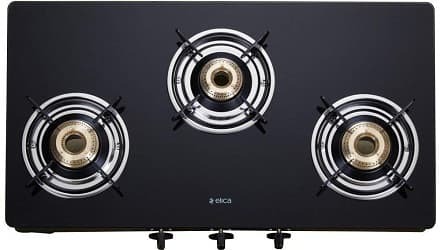 Elica Vetro 3 burner glass top gas stove is lined with superior finish to offer rust resistant texture and durable performance. It comes with 2 years of warranty and toughened glass improves the overall aesthetics of stove with safety and durability. Under the glass is stainless steel plate support to maintain its durability and sturdiness with 3 burners of different sizes – 2 medium and 1 small for different needs. This gas stove is manually operated with smooth knobs. The euro coated grid keeps your pots and pans stable. This way, your burner can be more reliable and looks beautiful always. With Eveready TGC 3B Glass Top 3 Burner gas stove, you can rest assured that it is highly durable with toughened glass that has premium finish to add elegance to your décor. It has 1 medium and 2 large brass burners to cook several dishes quickly by taking lesser gas. It has manual ignition type burners. Your gas stove looks newer for years with spill proof design, powder coated supports, and stainless steel drip tray. The gas inlet has 360 degree swivel to place cylinder on any size according to your needs. The knobs are also ergonomically design to provide better grip to adjust flame of burners. 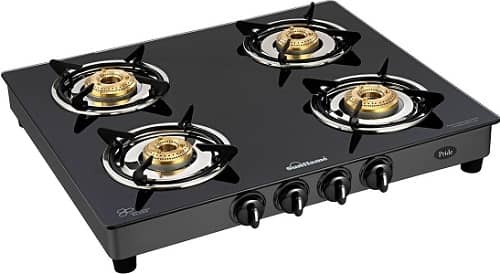 Sunflame GT Pride Glass Top 3 Burner Gas stove boasts 3 highly efficient brass burners of different sizes which are ergonomically designed and are spaced well to cook three dishes without any problem. These quality burners are made for even cooking with three flames rows to save fuel. It has powder coated pan supports to use vessels of different sizes at a time. It is also easy to clean and maintain the glass top. Gesto Vista Glass Top 3 Burners gas shove is very efficient. It has toughened glass top which is designed to be shatter proof. It is designed to make your kitchen look appealing and elegant. It has spill-proof burner stands so there is no need to worry about toppling of vessels. It has easy to use and ergonomically designed knobs. In addition, they are designed to avoid gas leakage for efficient and safe cooking experience. The stove has compact design to save plenty of counter space. With multi spark auto ignition, 8mm thick black toughened glass top, rich matt steel build, matt steel drip tray, and 4mm thick pan supports, Glen GL 1033 GT glass gas stove has 3 aluminum alloy burners of different sizes for all cooking needs. It also features auto ignition. Hence, the flames light up without lighter or match box. All you need to turn on the knob while holding the ignition button. When ignition button starts sparking, turn the knob and it will light up the burners. The smooth knobs offer friction-less rotation to adjust flame intensity. The Prestige Premia Glass Top Gas stove has been designed with German standards of SCHOTT to provide the best quality glass. The glass made by SCHOTT is tested to become highly thermal resistant and mechanical impact resistant as compared to other glass. You can cook more efficiently and faster with its glass burner design. SIGRI-WALA is a leading and reputed brand in making fuel-efficient and easy to clean gas stoves. This 3-burner gas stove has toughened glass top with premium finish. It is embedded with multiple burners for a multi-tasking household. It has automatic ignition to operate without match stick or lighter. It is safe from spills and assures easy maintenance and cleaning. We hope this guide has helped you choose the best gas stoves for your kitchen. You can choose these gas stoves depending upon your needs and convenience.